I was fascinated by this book that I saw on Amazon a few months ago. 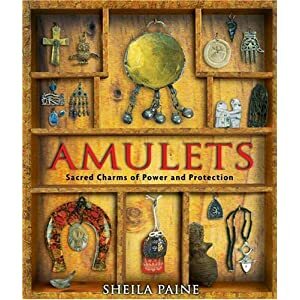 Amulets: Sacred Charms of Power and Protection is a great overview of how magical objects are used by cultures throughout history and around the world. My first glance through this book resulted in several new ideas for beaded jewelry designs, and as I'm thinking about what I want to accomplish in 2013, I'm thinking that maybe a series of beaded jewelry or beaded objects based on the amulets in this book might be just the thing. Fascinating to read about all the different objects, both man made and natural, that have been used throughout history as protection against the dark magic and bad luck. Beads play a prominent role in many of the amulets pictured and discussed in the book. A quick read, inspirational, and perfect for someone looking to incorporate some magic into their beading and jewelry making projects!